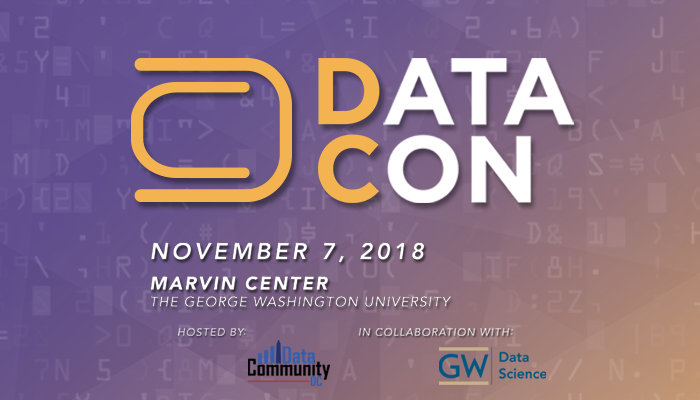 The Call for Papers for DC DATACON 2018 is now closed. All submitters will be notified via email of their status no later than Monday, July 16th 2018. DC DATACON is focused on the applied tools, technologies, and methodologies that make data science work. We aim to foster a multidisciplinary conversation that explores the technology, economics, ethics, and strategy of the world’s fastest growing discipline – Data Science! The theme for 2018 is “Simply Data Science” and will emphasize how, by leveraging design principles and making the right design decisions throughout the entire data science technology stack, we can create intuitive, accessible systems that anyone can use. Ethical Data Science: discuss privacy issues and ethical guidelines when working with data and algorithms. Data Science by Design: how design thinking is leading to the development of more resilient and accessible data science applications. AI Amplified Expertise: how does AI facilitate collaboration at unprecedented levels and how to design machine learning systems to be effectively embedded into current business processes. Workforce Implications of AI: how will AI impact our current workforce in turns of job displacement versus job enhancement, what can workers be doing today to prepare for an AI future – in this area, we encourage presenters to target a specific market or compare and contrast the impact between market sectors. Blockchain Applications: how public and private organizations leverage distributed ledger technology, artificial intelligence, robotic process automation, and virtual and augmented reality to modernize IT and the delivery of products and services. Data Science in the Quantum Paradigm: how will the advent of quantum computing change the way we think about data, application development and education. Success Stories: how has data science been used to improve business operations and how you did it (tools, techniques and technologies). Conference presentations will be 30 minutes in length, including Q&A. What makes a good DC DATACON presentation? Let your personality show. Be creative. Be quirky. Even when speaking on a similar topic as someone else, your presentation and style makes it different and interesting. Demonstrations and showing technologies in action are great. Just let us know ahead of time and we’ll support you. Avoid marketing. You can talk about your company, your technology, and your projects, but tell the audience about what you are doing, why you are doing it, how your technology works, why you made the design decisions you made, what’s working and not working, etc. Avoid technology (or any other form of) partisanship. It is good to take positions on things (that’s leadership and it is needed and most welcome) but please do so by talking up the merits of your position versus talking down alternative views. Finally, Make an Offer or Present the Audience with a Challenge. Tell them what they can do have an impact in your field of expertise when they leave the conference. Open Science Framework: We encourage and ask for your consideration in using the open science framework for sharing data and results (although not required to submit).